All axes on the machine are driven by ACME threaded lead screws. One end is attached to a NEMA23 stepper motor via a coupling. The other end is supported by a 3/8″ double shielded ball bearing in a mounting block with thread clamps on each side, to further reduce backlash. The ball bearings and the bearing mount blocks have a very slight interference fit. So I thought “why not heat up the blocks on the Fab@Home heated build base?” They were heated to around 100°C in order the expand them. The bearings were placed in the freezer in order to shrink them a little. This made it slightly easier to get the bearings to fit into place. I ended up using an Arbor Press to get the bearings flush into the block. When using the press I made to sure to exert the force on the outer casing of the bearing, in order to keep the load from being directly placed onto the ball bearings themselves. These blocks will be fastened into position. From the above image, the top block will attach into the base table while the other two smaller blocks will either attach to the Y or Z axes (they are basically the same design). I did not turn down the ends of the ACME threaded rod as is common with linear motion stages. This is because I purchased couplers and thread clamps that are threaded to my ACME size. So this saves a little bit of time by avoiding another part that needs to be machined, also having threaded clamps and couplers will hold my lead screws in place better. 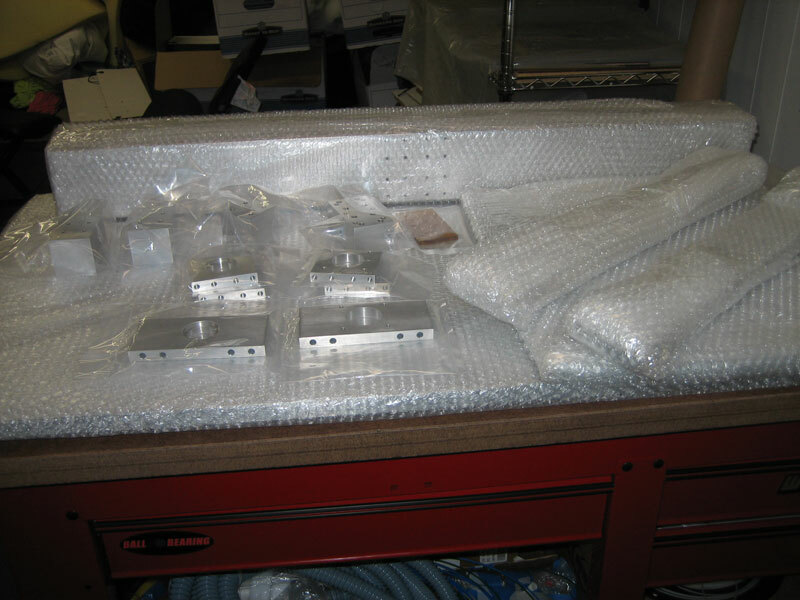 Once I had received the finished parts, assembly moved pretty quickly as I had been eagerly waiting after a number of delays to get this machine assembled and running. You many notice in the above image that the majority of the 16 parts are fairly simple block-like shapes. This was intended to reduce the overall job cost. The cost of getting a part professionally machined is directly related to the number of different machining operations and set-ups a machinist needs to perform in order to complete a part. Sure, I could have made some wild looking parts, but I kept this in mind when designing the machine as I wanted a functional 3d printer of this size at the lowest price point to me. First up was screwing a matched set of THK Linear recirculating ball bearings into the ~90lb [~40kg] slab of aluminum, which serves as the foundation for the machine. These bearings are the X-axis of the machine and each rail has counter sunk through holes for the metric fasteners that screw into the base. Each bearing came with two blocks on each rail as you can see in the above picture. To maximize the travel of each axis only one block was used per rail in the X and Y axes. 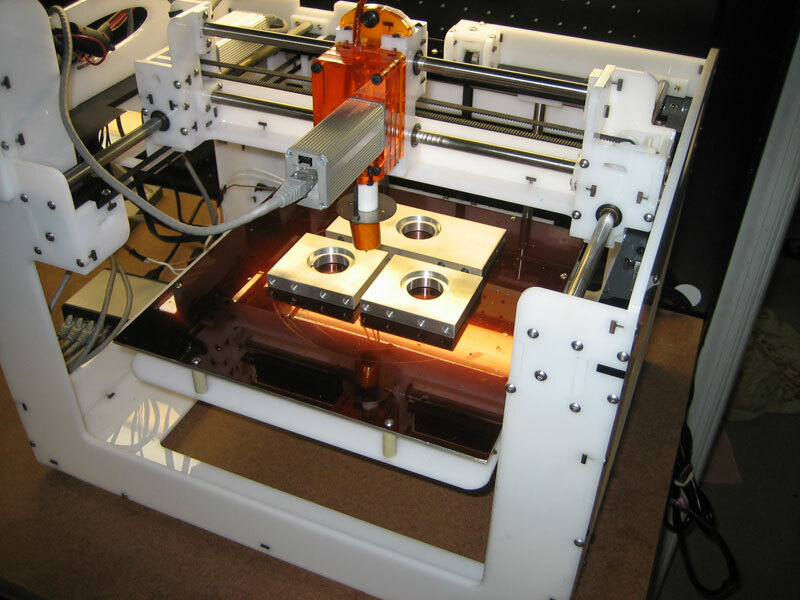 The Z axis uses both for rigidity. Thank you everyone for the overwhelmingly positive response since I launched yesterday! I have received a ton of emails, so if I have not responded to you yet, don’t worry, I will get back to you! I have been asked quite a bit of very detailed questions about my printer, So I thought it would be best to write a series of posts, complete with pictures, documenting the construction of the machine. Now, this was not the first Solidworks CAD model I made of this printer, it is actually version 3.2 to be exact. I went through a number of design revisions in order to come to a modular, robust and reconfigurable design at the best value. But really what this whole machine is based off of, is the linear bearings. I bought 3 matching pairs of brand new 450mm long, THK linear recirculating ball bearings on eBay for a great deal I could not pass up. Once I had bought them, I decided that if I had these rather long linear rails, I might as well make a machine that takes advantage of their long length in order to achieve the largest build area possible. 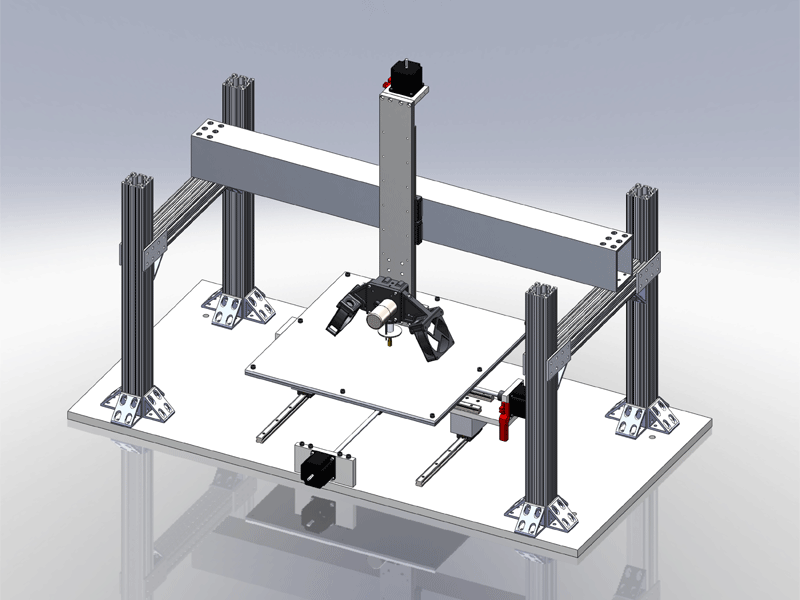 The build area of my machine is 403.00 x 403.00 x 322.70 mm [15.86 x 15.86 x 12.70 inches]. There are a number of features I designed into the machine for a future use which I have not yet thought of. If I was going to invest all this time, effort and money, I wanted a design that I could experiment with and be capable of using a variety of print heads. The best example of this is the 80/20 extrusion used to support the Z axis. This is so the height of the Z axis can be varied depending on the tool and task. For example, if a rotary cutting tool head is attached to cut wood, the Z axis would ideally need to be located as close to the cutting surface as possible to reduce the moment on the axis. 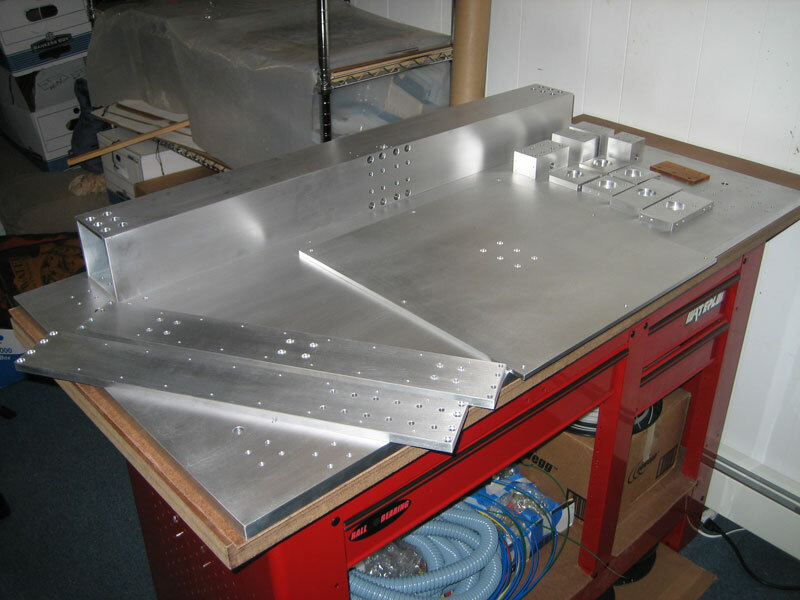 Other features include a removable build base so different types build surfaces can be tested. 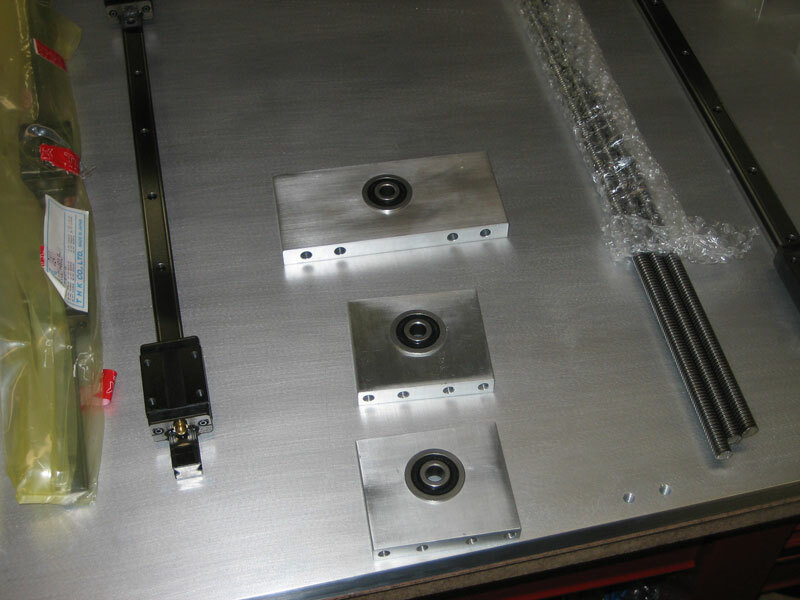 There are also lots of mounting holes for future tool heads of any size as well as the ability of the Z Beam (the long, square aluminum tube that is on the top of the machine that holds the Z axis) to be secured at any position along its 80/20 support for print tools of all shapes and sizes. Once I had finalized the design, I created a set of engineering drawings so my parts could be sent out to a machine shop. 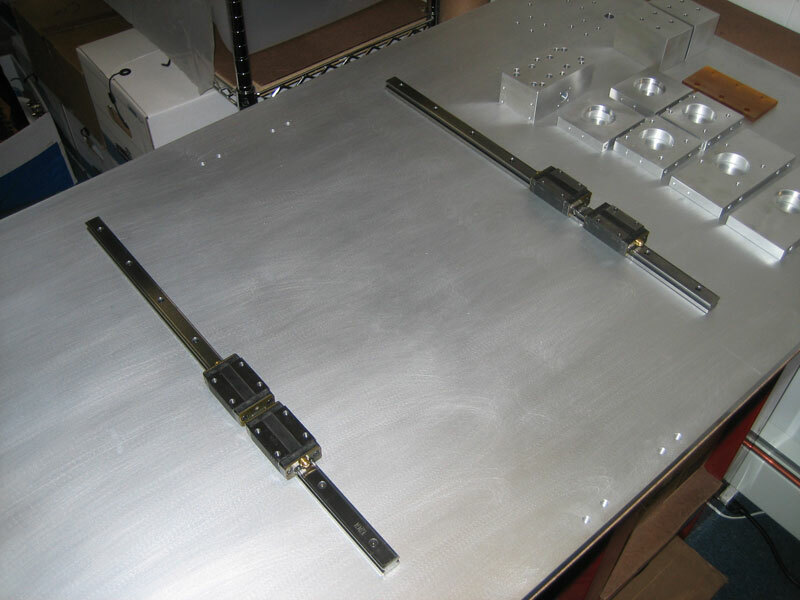 Due to the size of some of my parts, such as the table (which is a 2 x 4 foot, 3/4 inch thick [61 x 122 x 1.9 cm] slab of aluminum, I was not able to machine them myself. Luckily I have a friend who owns a local machine shop with some very large CNC mills, so I hired his shop for the job. The result of this, is above, wrapped in bubble-wrap. I think this a good place to stop for today. My aim is to update this blog almost every day/other day, so stay tuned for more to come!